Presenting: Parafilter by BHK Samples. A New Generation Filterbank with a Serial & Parallel signal flow whose Filter LFO channels can be modulated, automated and mixed using the flexible on-board pattern sequencer. Parafilter comes with a total of 4 audio inputs and outputs. An input and output that split up the sound source internally. And three audio input and output channels to allow also mixing and sequencing of different audio sources, and connecting pre/post effects. Due to Parafilter’s quick and easy workflow, gated rhythms, funky grooves, complex sequences, lovely vibes, organic movements, modulated loops and one-shots can be created in a matter of seconds; inspiration is guaranteed! To this end, you have 4 selectable patterns at your disposal which you can arrange, edit and combine in real-time. 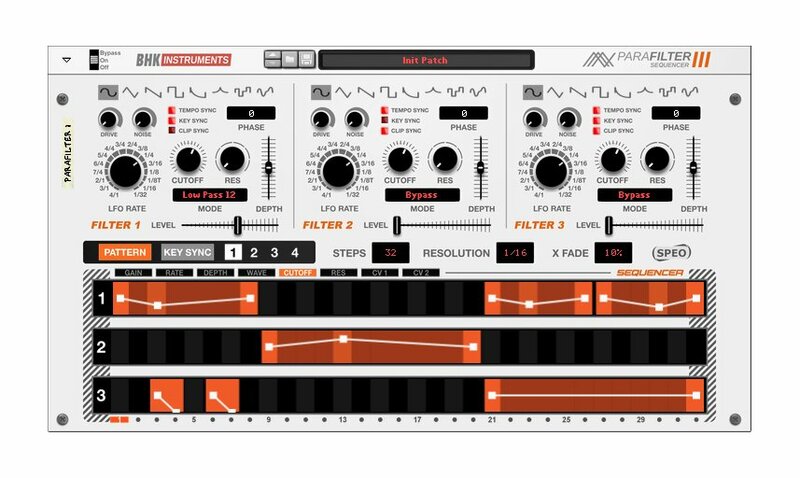 Besides being a powerful tool for all kinds of wicked sound design, Parafilter also shines at enriching static recordings with dynamics and expression. Each channel is equipped with various filter types, such as LP 12/24, BP, HP12/24 and Notch, 8 invertible LFO waveforms, as well as phase start, tempo sync, key sync and clip sync options. Together with the combinator, created modulations or automations can also be triggered repetitively. For those who like their sound dirty or noisy, each channel offers Drive and Noise. Flip the rack around to find a set of CV inputs for cutoff frequency, resonance and LFO modulation depth per channel. Using the 6 CV outputs that are programmable in the pattern sequencer, as well as 3 LFO CV out and 3 LFO*Depth CV Out, Parafilter can also double as a powerful sequencer and resampling tool for your Sample, RE and VST collection.